Casey takes off on the final stage of the Dakar rally. 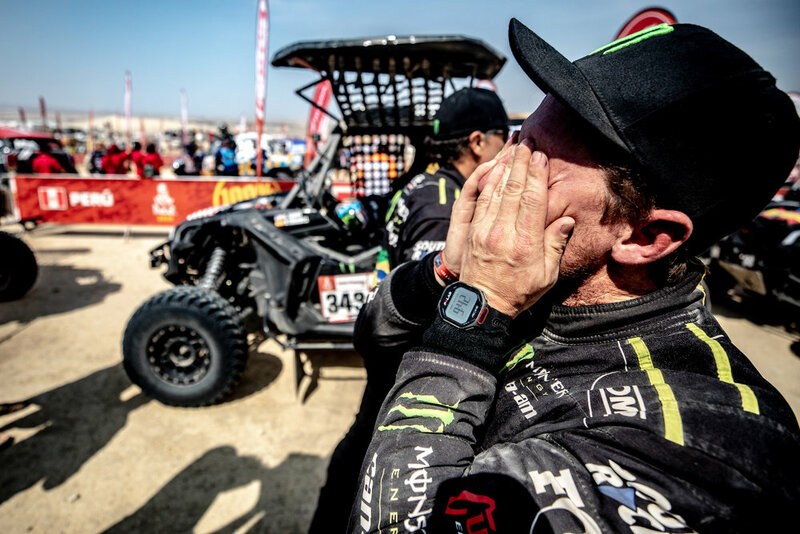 Dakar 2019 has had its ups and downs for Casey, but he has pushed through them and made his way to the final stage. Stage 10 was a short 111km sprint with 90% being sand. With finishing top 3 in the standings nearly impossible to reach the strategy was simple, be consistent and get to the finish. At 7:58am Casey would take off on the final stage of the rally. It would take him 1H 37’ 28” to finish the stage 7th and solidify his 4th place overall in the SxS class. He would also win the rookie class for the SxS by an impressive 2 hours and 10 minutes over the next rookie. Casey would also finish as the top American on the rally with his fellow American Andrew Short finishing 5th in the bike category. A tough ten days have come to an emotional end. From the end of the special it was a 244km liaison back to Lima, to the beach bivouac we started at. A nice team BBQ was had before the podium celebrations took place. Just like opening podium, the area was filled with fans eager to see their favorite driver. One by one each competitor would get their fame of finishing the toughest rally in the world. 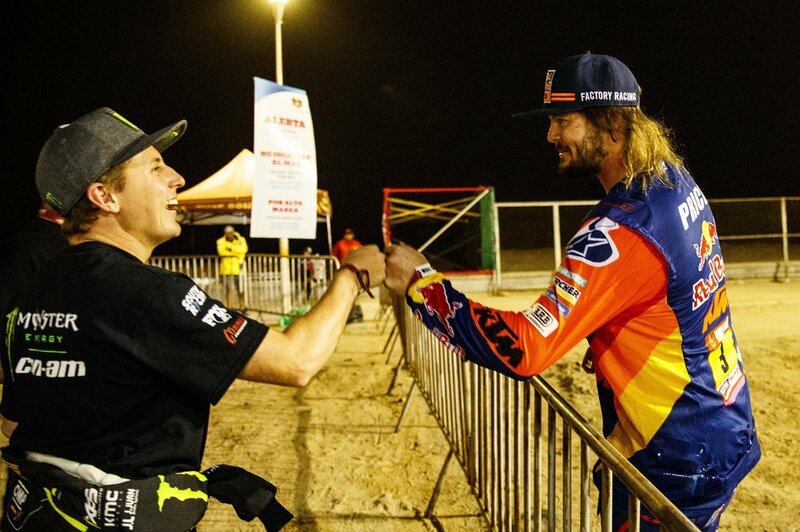 Giving props to the newly crowned Dakar bike champion, Toby Price. 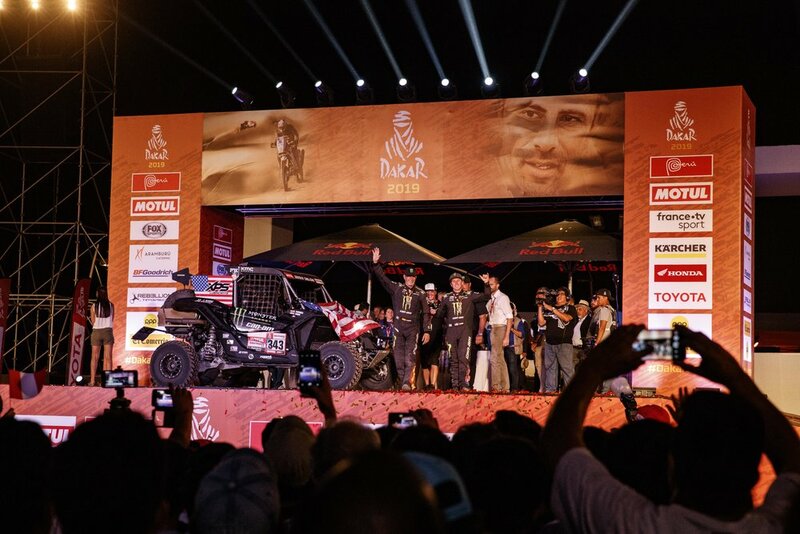 Finally atop the podium and the Dakar rally is complete. 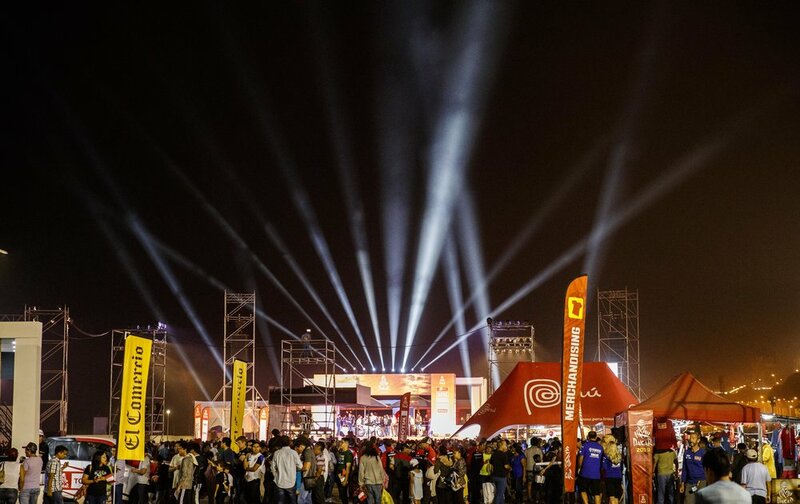 The podium is a sight to see with thousands of fans gathered. The sky lit up for the team bbq. New hardware to add to the trophy case. Scott Abraham and Joe Parson hang on for a final ride throwing out stickers and taking selfies. One last team photo would end the night and everyone would start to go their separate ways. The rally was a long 5600km and would have Casey finishing it in 44h 51’ 56”. That doesn’t even include all of the time spent on liaisons. To put things in perspective, out of the 30 SxS that started only 20 finished. For the bikes, 76 of the 141 starters finished and in the car class only 52 of the 96 starters finished. 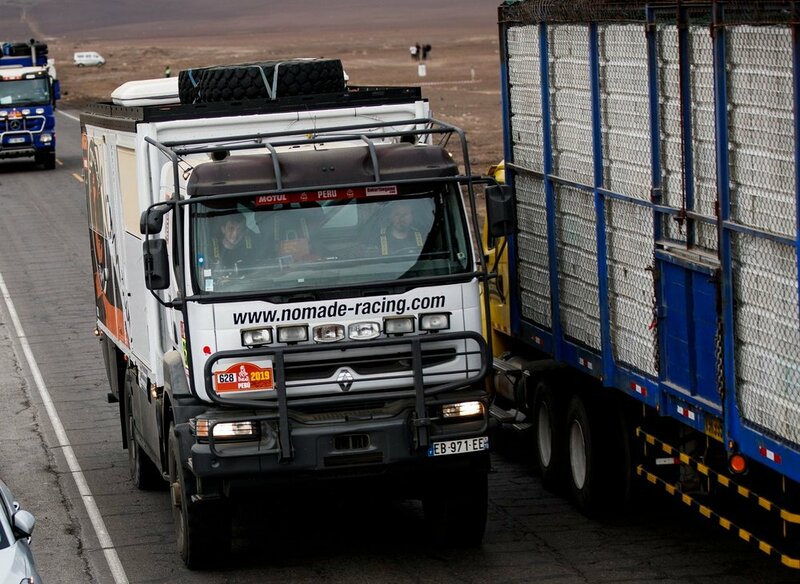 This is an insanely tough race to just complete, its hard to imagine what the 15,000km Dakar rally would be like. 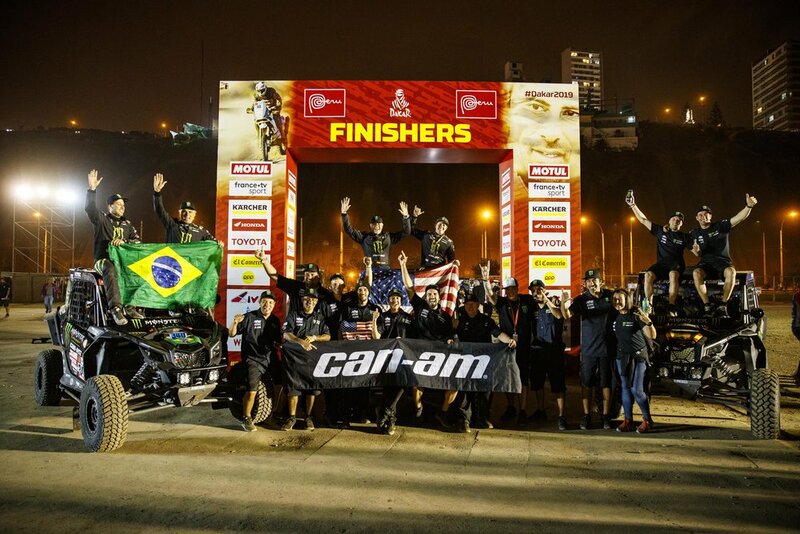 The elusive first American to win the Dakar rally is still out there and Casey will be back next year to attempt to make it happen. Until then, I’ll leave you with some of the weird things one might see on a Peruvian highway. These harvesting trucks stretched from lane to lane in Peru. This biker looked like he was ready to solo the entire Dakar Rally with all of the gear he packed on his bike. Joe Parsons gives the horns as he chases after the top bike competitors. A RV chassis stacked on a RV chassis driven by a man wearing a helmet. This is one of about 6 we saw, wild. The highways get tight when you have massive trucks rolling through both lanes.